The landmark Departmental Building (as it was known) at 15 Stout Street, Wellington was built between 1939-41 by Fletcher Construction. The Category 2 listed heritage building, with its impressive granite cladding and heritage curved bronze single-glazed windows has, over the years, housed various government departments – Treasury, Defence to name a couple. 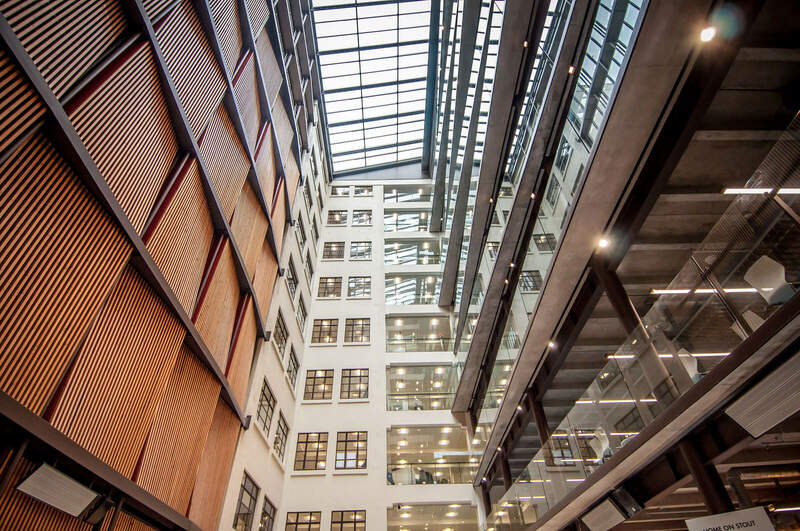 In 2015 this building, now the home to some two thousand personnel for the Ministry of Business, Innovation and Employment, achieved a 5 Star Green Star Built Office rating after a major refurbishment by McKee Fehl Construction. With a net lettable area of over 19,000 m2 of office space, it is a significant office block in Wellington’s central business district. The acoustics with consideration given to the open plan nature of the floors and the central atrium design. 149 bike parks with extensive shower and locker facilities were created (with 25 car park spaces provided). Intelligent lighting with auto dimming occupancy sensor controls are linked to the BMS throughout the building. These controls were used to setback meeting rooms temperatures when unoccupied. Accoustics were designed to meet the highest Green Star rating criteria. The project was completed on time and $2.2million under budget. Measured water usage indicates significant reduction of consumption when compared with other new office building. The building’s intelligent design should deliver significant taxpayer savings, in the area of $40-$50 million over the next 20 years.